The clubof.info Blog: Greece: long vs short-term poverty? Explaining the dilemma facing Greece on whether to continue austerity to pay off debts, or to fight for "debt forgiveness", Immanuel Wallerstein offered the following commentary. "Greece’s difficulties are self-created because successive Greek governments and Greek citizens have spent recklessly money they didn’t have in order to sustain a collective life style beyond their level of collective income." Greece must cut "collective expenditures in order for it to repay its extensive loans." "Over time Greece will emerge stronger." Reform camp's "most vocal and uncompromising spokesperson has been Germany’s Finance Minister Wolfgang Schäuble. He has been making two main arguments: Greece should leave the Eurozone “temporarily” and Greece should be held to the strict payment of all outstanding debts." Greece's problems started "essentially when the military dictatorship was overthrown in 1974 and a left party, PASOK, led by Andreas Papandreou, emerged as a major force on the scene. This date puts the blame solidly on Greece itself for adopting the social-democratic policies of successive governments." “Austerity” is "cruel and heartless, forcing an ever-growing part of the Greek population into abject poverty." "A regime of austerity will not, cannot lead to an end to the present acute depression in Greece." "Each successive loan has increased, not decreased, the rate of unemployment and has made it less possible to achieve its ostensible goal of restoring Greece’s “competitivity” in the world market." "Call instead for substantial debt forgiveness and a reversal of the demands of creditors that Greece make cuts in pensions and other parts of the social security net." Debt forgiveness has "increasing support from prominent economists like Joseph Stiglitz and from Christine Lagarde, the president of the International Monetary Fund (IMF)." Greece's problems started "earlier, somewhere in the 1930s, when the West European governments, and particularly Germany, imposed a subordinate quasi-colonial system in Greece. This puts the blame squarely on capitalist and imperial forces." Once it came to power in 2015, the (formerly) radical left party Syriza "had to face up to the dilemmas of being the government, which does not allow the easy positions of being a radical opposition movement". 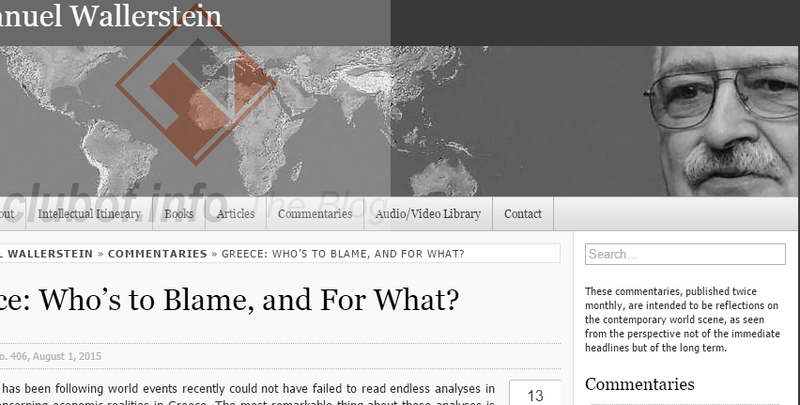 Syriza betrays the Greek people? According to Wallerstein, Syriza has proven to disappoint the Greek people through no fault of its own but because of the constraints on any national government that come from the world-system. Any national government has to behave a certain way within the international community and Greece is no exception to this. Syriza never envisaged any alternative plan than seeking state power, and now that it is in government, it has found that it has almost no options at all. Of the options that do exist, all appear to be bad for Syriza and are likely to result in resentment and a sense of betrayal among Greeks. The choice facing Greeks can now be narrowed down to the long-term poverty imposed by the terms of loans that Greeks feel they will never be able to repay, and the short-term poverty of leaving the Eurozone. Leaving the Eurozone will have disastrous effects on the standard of living within Greece but will free Greece from the chains of debt. According to Wallerstein, that is the choice facing the Greek people at this juncture.